For individuals who want to progress past 5k runs, an 8k run is a good distance to work toward. An 8k run equals five miles and requires runners to develop endurance, strength and stamina. Training for an 8k is similar to training for a 10k. You need to involve longer runs, speed runs and maintain healthy nutrition. Build a strong mileage base by running three to four times a week. Start slowly and increase mileage or intensity by no more than 10 percent each week. 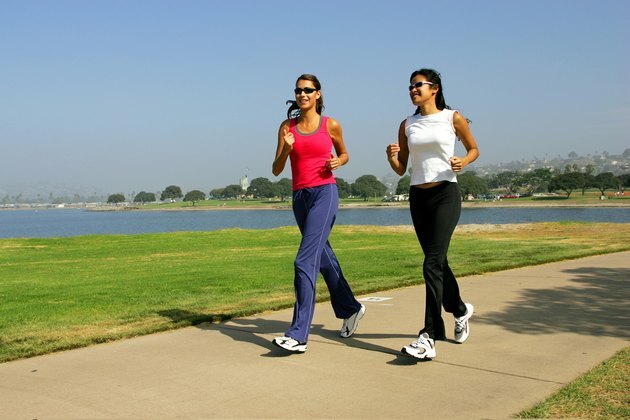 You should be running between 15 and 25 miles each week to be able to complete an 8k. Include one speed run each week or every other week to train muscles to move faster for longer distances. Dedicate one run doing mile repeats, running each mile between 80 to 85 percent of maximum heart rate. Before you start any speed run, warm up at an easy jog for one mile. Rest at least three minutes between each mile. Run between two and four miles. End each speed session with a mile cool down. Dedicate two exercise sessions each week to strength training. Long distance runners typically have over-trained quadriceps and tight hamstrings, which increases your risk for injury. Focus on exercises that target multiple muscle groups and perform between eight and 10 repetitions and two to three sets. An example of a good exercise is a lunge with a bicep curl. Another example is a squat with an overhead press. Include exercises that target the core muscles, such as woodchopper or kettlebell swing. Cross-train and rest are necessary each week. Cross-training means performing activities other than running and can include yoga, cycling, strength training or walking. Cross-training days should be low intensity and allow your muscles to recover from running. Rest one day a week to recover and to prepare for future runs. Stretch after each run. Runners with limited flexibility increase their risk for injury and decrease their ability to perform. Muscles that are tight are not able to go through their full range of motion, limiting your ability to run. Stretch all major muscle group for 20 to 30 seconds and never stretch to the point of pain. Write down each run's mileage to make sure you are training enough. Listen to your body and take an extra rest day when you feel over-trained. Wear properly fitted running shoes to avoid injuries.